Length: 2 Miles (one way) on maintained trail – does continue another 11 miles on unmaintained trail to Forest Road. Word to the wise – this trail gets busy so be sure to get to the parking area early in the morning to ensure you won’t have to wait to get a parking space. Parking is $10. Okay, so we had some issues finding the trail head. If you’re looking at the bathrooms – the trailhead is to the left and up towards the top of the parking lot near the road. This is a very easy and steady hike on sandy ground. 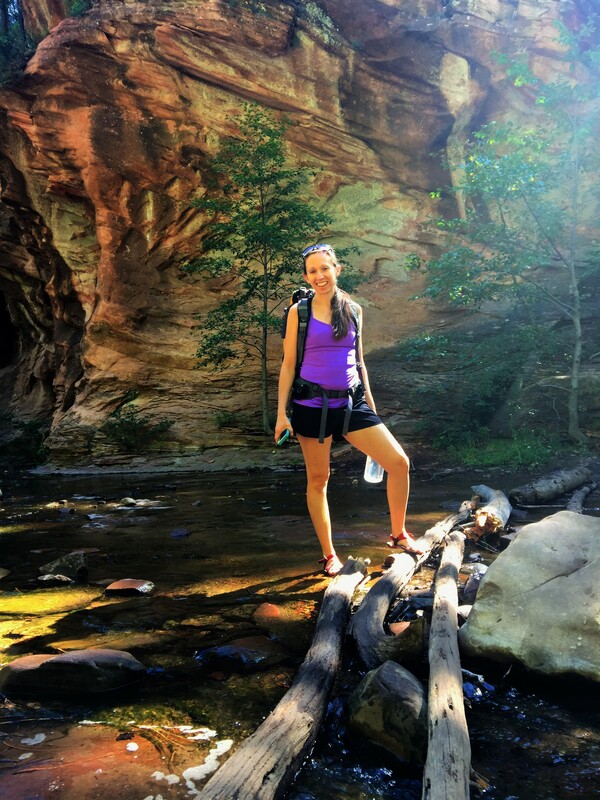 The trail follows a branch of the Oak Creek and you’ll see lush green plants growing in every crevice of the hard mountain surrounding the creek. Listening to the trickles of the stream and seeing the water makes this one tranquil hike. 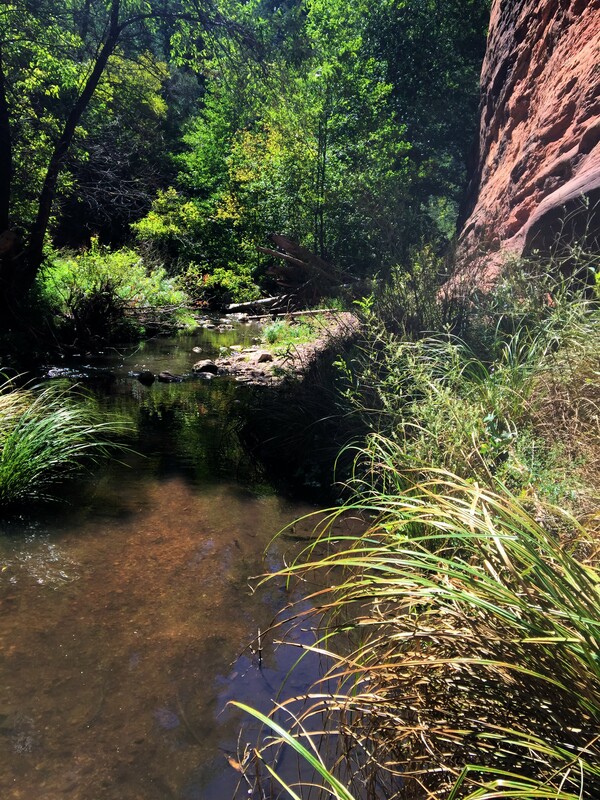 I feel that Sedona has this amazing relaxing and spiritual energy encompassing the city and it remains on West Fork Trail as well. The charming part of this trail is that there are 13 times that you will have to cross the creek. 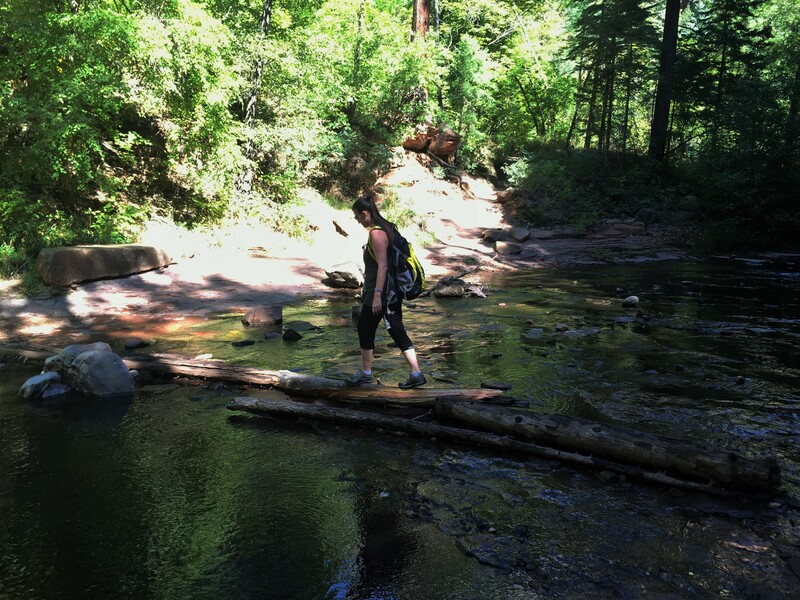 The water is only a few inches deep in these crossing areas and there are rocks and logs strategically placed that can be walked on in order to cross. Although, it can be slippery and your foot will likely go into the if you lose your balance. I would highly recommend wearing water shoes. The actual trail part is mainly sand and dirt so hiking in water shoes wouldn’t be a problem. 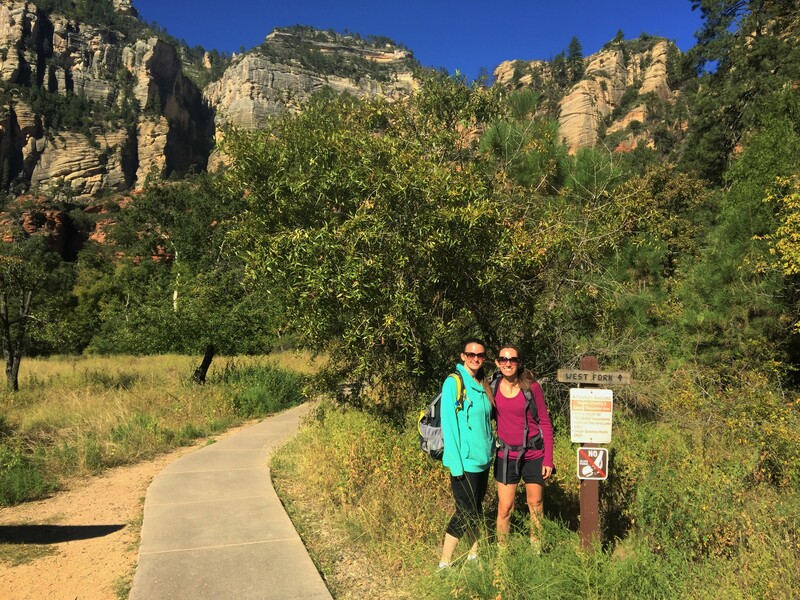 At 2 miles you will see signs stating that the maintained trail ends but it does keep going for another 11 miles (on an unmaintained trail). If you decide to hike on the unmaintained portion of the trail, you can set up camp on it as long as you have a permit/reservation. We walked a little way on the unmaintained portion and it was really exciting. Although it says it’s not maintained, we were still able to make out the trail just fine. In order to keep going you have to actually walk in the creek. The first portion is shallow, just going up to our knees. After that point we found a shady spot on the river bank and had our lunch. A few other hikers told us that as you keep going on the trail you have to actually swim on portions on of it. The further you go on the unmaintained trail the less crowded it becomes. 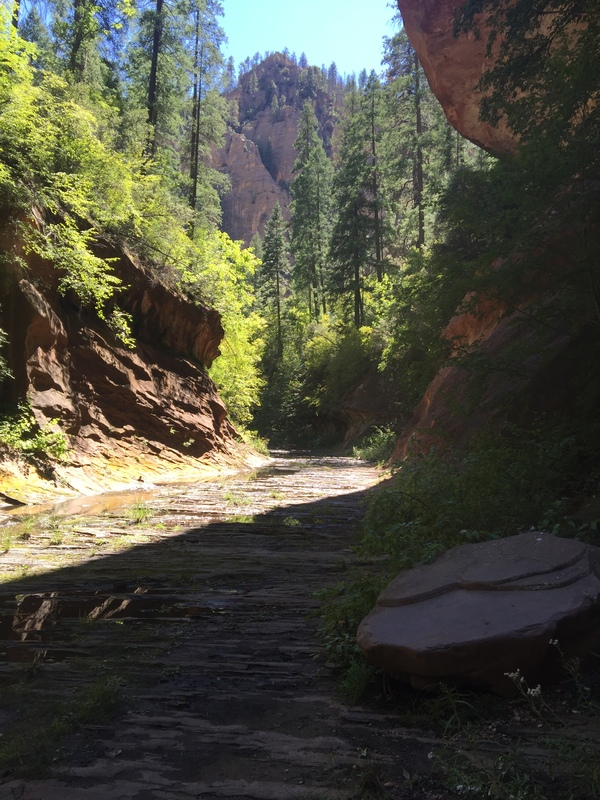 You’ll see this trail mentioned in numerous hiking sites, because it is rated as a top hike to do in Arizona. Meaning that this trail is super popular! And while I personally try to avoid busy trails West Fork Creek Trail is a must! You won’t regret making the decision to do it! Be aware that it will probably be busy when you go so you should arrive early in order to get parking spot. We left the trail around 3:00pm and there were cars lined up waiting for a spot. It did seem though that a lot of people would park, get out of the car look around for a little bit and then just leave. So if you do have to wait, it probably won’t be that long.